Urban Coup members Cath, Nathan and Sally spoke recently at OASES Graduate School for their September Sustainability Breakfast. Donna Livermore and Ben Habib also spoke on their earnings and experiences transitioning towards a low carbon, localized lifestyle. 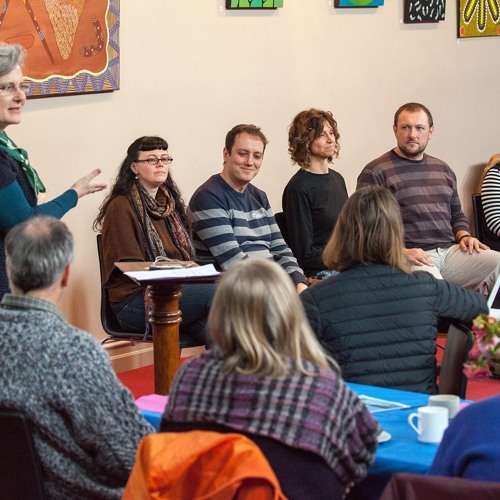 The attendees came from a range of backgrounds: transition towns, co-housing, permaculture and local energy trading systems (LETS) and shared their stories, questions, and quandaries: what is shifting? How is your community responding to the call? What is inspiring us to connect and share? What are we as change agents and transitioners moving towards? You can listen to all four parts of conversation or skip straight to Part IV, in which Nathan, Sally and Cath talk about how cohousing work, how our decision making processes enable our community, and the connection with sustainability. OASES hosts the Sustainability Breakfasts every month.